Quick update on Getech (GTC). Summary: These interim results were poor, but that was no great surprise given GTC supplies specialist data and services to the battered oil and gas sector. At least the promise of cost cuts and a few new contracts ought to signal a better second half. Valuation remains tricky here with reported losses and a scrapped dividend, but the asset-rich balance sheet should see the business through the downturn. I continue to hold. I wasn’t too shocked by these figures, not least because November’s annual results had already owned up to trading being “substantially below current market expectations”. On the face of it, revenue of £3.3m — down 9% — did not look too bad in the circumstances. However, the prior-year half did not include any revenue from ERCL — a geosciences consultancy that was purchased during April 2015. Had ERCL been owned throughout 2014/15, I reckon the reported revenue drop would have been about 40%. Sadly the revenue setback led to a £697k operating loss and a passed dividend. However, such disappointments are not uncharted territory for GTC — the firm reported first-half losses during 2007 and 2010, and skipped dividend payments for two years between 2009 and 2011. I am glad GTC’s outlook statement gave shareholders some cause for hope. It is difficult to determine GTC’s cost base exactly, and whether the group’s definition of ‘cost base’ includes items such as the cost of inventories and depreciation/amortisation. Nonetheless, I calculate reducing all H1 costs by 17.5% would have produced a break-even performance in these results, and I’d like to think the firm’s target is break-even (or better) from here on in. Something else to note is that GTC’s chief exec was effectively demoted to the position of Commercial Director in February, which may have been part of the cost-cutting strategy. Anyway, GTC is presently without a long-term leader and I am hoping a co-founder of ERCL will soon take the top job. These H1 figures showed net cash drop from £3.7m to £1.8m. Although the £1.9m reduction was not great, there were some costs that appeared ‘one off’ (at least for the time being). For a start, £576k of the outflow related to the purchase of ERCL while another £572k was distributed as last year’s final dividend. A further £459k was spent on capitalised development costs, the accounting for which I’ll explain in a Comment below this Blog. Having evaluated the cash flow statement and considered the aforementioned cost cutting, I do not envisage GTC’s cash recourses will dwindle much lower from here. That said, the group’s largest liability is the final earn-out for the ERCL deal, which remains in the books at a £980k minimum. (However, this earn-out could be lowered if ERCL’s near-term performance does not live up to expectations — a genuine possibility I think). With earnings now transformed into losses and the dividend given the chop, the only accurate value benchmark left right now is the balance sheet. These figures show GTC’s net asset value to be £9m or 27p per share, while tangible book value is £3.6m or 11p per share. For what it is worth, when GTC reported losses and cut its dividend in 2010, tangible book value was 10p per share and the shares hit a low of 11p. So there is a precedent for GTC’s shares to trade very close to book value! It’s difficult to say whether GTC’s shares will retreat again towards 11p. I suspect not — not least because the group recovered well from its 2010 troubles, some of its intangible data licences might actually be worth something, while that £980k-plus ERCL earn-out liability may not have to be paid in full. Bear in mind, too, that GTC’s operating profit averaged £1.4m during the five years between 2011 and 2015. So any return to that level of trading would I’m sure produce considerable upside to the current £9m market cap. All that said, I must confess I am not tempted to top up right now at 28p — but I could buy more if the price goes lower. GTC does have net cash, should survive the current downturn and demand for its range of specialist data and services ought to rebound as and when the oil sector recovers. When that revival occurs, of course, remains anyone’s guess. This entry was posted in Getech, My Shares and tagged Getech, GTC on April 7, 2016 by Maynard Paton. Well, these H1 results showed a further £459k of capitalised development costs and I am quite sure it all relates to this multi-satellite gravity project. GTC has so far spent £1,517k on this project, funded by clients, and it seems to me a further £400-500k could be spent in H2. For FY17, I expect to see little-to-no capitalised development costs as per GTC’s history prior to FY15. For now at least, it is not clear whether any of the £1m or so given to GTC by clients in FY15 for this multi-satellite project has been shifted from deferred income to actual revenue. The limited H1 balance-sheet numbers show current trade and other payables reducing from £4,626k to £2,916k, but that reduction may be due in part to the ERCL earn-out being paid/reduced. When published, the 2016 annual report should have all the answers. At least this multi-satellite project was mentioned in passing within these H1 results, so at least somebody feels the data is important enough to purchase. From this report ERCL’s annual profit can be analysed further. First off, we know GTC’s 2015 annual report stated ERCL produced revenue of £936k and a pre-tax profit of £230k from purchase, 7 April 2015, to 31 July 2015. GTC’s 2015 annual report also implied ERCL’s revenue for the year to 31 July 2015 was £4,235k and that its pre-tax profit was £1,600k. 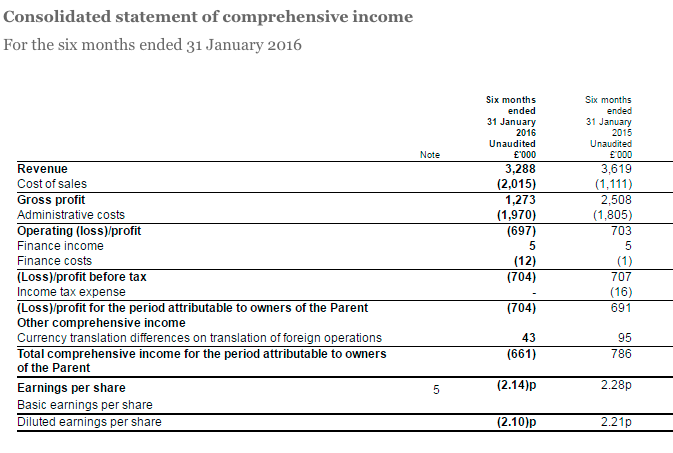 Now with ERCL’s 2015 annual report, we can deduce that from 1 Aug 14 to 31 Dec 14, ERCL’s revenue was £1,812k and its pre-tax profit was £531k. 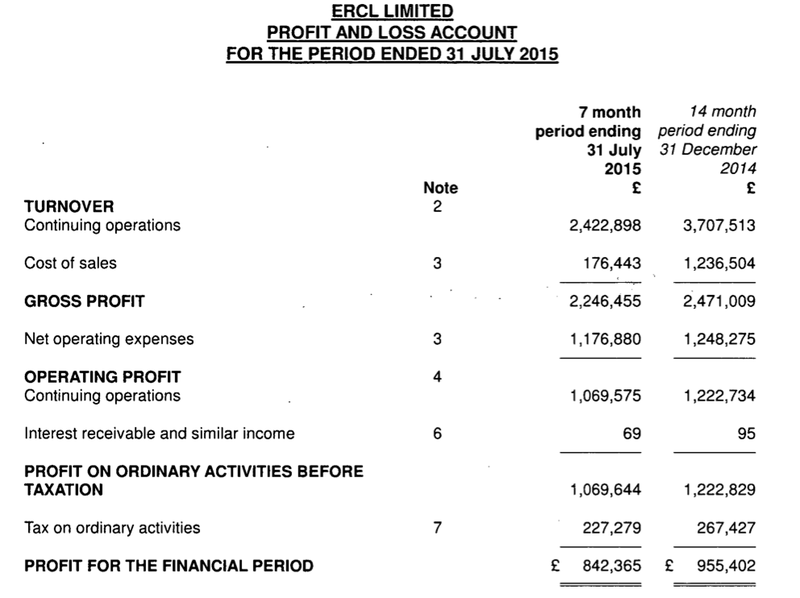 We can also deduce that from 1 Jan 15 to 6 Apr 15, ERCL’s revenue was £1,487k and its pre-tax profit was £840k. Anyway, it all boils down to ERCL suddenly becoming notably less profitable under GTC’s ownership (post 7 Apr 2015 — c£2k profit/day) than it was in the preceding 3 months (almost 9k profit/day) and the 5 months before that (c£3.5k profit/day). This profit deterioration, alongside those ambitious ERCL assumptions stated in GTC’s 2015 annual report (see that earlier link above), means I will not be surprised to see the £980k ERCL outstanding acquisition earn-out liability recalculated lower at the next set of annual results. This £980k earn-out was based initially upon “pre-determined performance levels” over three years. Getech, the geoscience services business specialising in the provision of data, studies and services to the oil, gas and mining exploration sectors, provides a trading update with regard to the year to July 2016. As previously reported, the Company delivered a loss before tax of £704,000 in the first half of the year, but had an extremely successful third quarter from February to April 2016. However, the market has continued to remain very depressed and a number of potential sales for the fourth quarter have now either been deferred or cancelled. As a result, the Directors confirm that the Company is trading below current market expectations. Nevertheless, the Company expects to generate a profit before tax for the year ended July 2016. Stuart Paton, Non-Executive Chairman of Getech Group plc, said: “We were pleased to have made such an exceptional start to the second half of the financial year, but the market has remained very depressed and clients in general continue to delay expenditure. However, interest in our products remains strong, and this is reflected in the heavy schedule of planned client meetings over the next few months. Disappointing, but not a great surprise given the parlous state of the oil service industry. From what I can tell, ‘market expectations’ for the year to July 2016 were based on the house broker expecting a £0.7m pre-tax profit and EPS of 1.7p. I think those expectations were looking a little optimistic given GTC reported a £704k pre-tax loss in the first half (see Blog post above). At least GTC today claimed it would still generate a profit before tax for the year to July 2016, which suggests the second half produced a pre-tax profit in excess of £704k. So there is hope the cost-saving measures referred to in the first-half results have now filtered through and the business can operate at break-even or better from here. Valuation remains tricky. The market cap at 25p is £8.2m and the real optimists would say the shares currently look cheap if the implied H2 £704k pre-tax profit could be sustained to give an annualised profit of £1.4m. That said, GTC’s peak pre-tax profit was £1.8m in 2015, and talk of cancelled projects in today’s statement may infer the ‘bumper’ Q3 was a truly exceptional result in the circumstances. 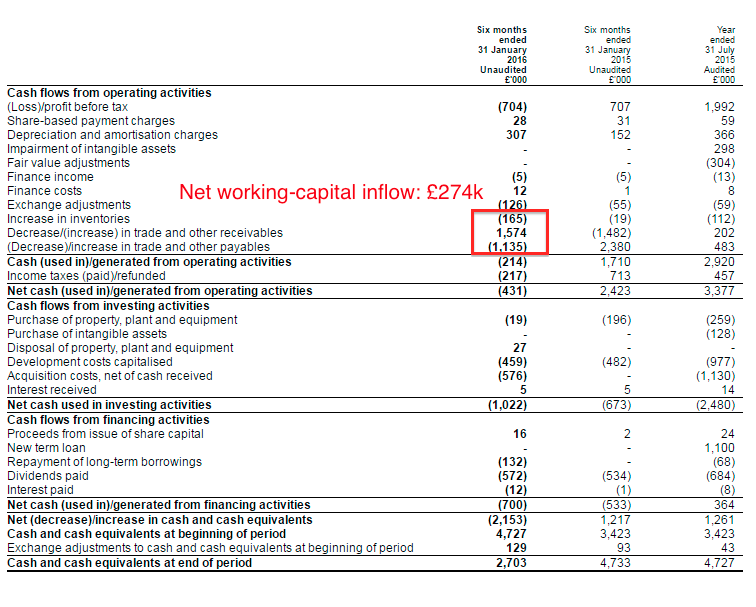 Within the first-half balance sheet, cash of £2,703k less borrowings of £900k gives £1,803k. Less at least the stated £980k liability for the ERCL earn-out, effective net cash comes to £823k or 2.5p per share. Of course the ERCL earn-out may be somewhat less than £980k in reality. GTC’s swish Leeds HQ has a freehold book value of £2,511k (7.6p per share). I suspect the board would have appointed Mr Edwards by now had both parties agreed. Just catching up with this announcement. * Exprodat’s 20 staff and revenue of £3,419k for 2015 = revenue per head of £171k. That is high, and compares with £86k at GTC for 2015. * Companies House confirms the “long and profitable trading history“. Exprodat’s 2002 accounts showed retained P&L earnings in the balance-sheet reserves at £111k, while by 2014, retained P&L earnings had swollen to £1,042k. Notably, every year between 2002 and 2014 has witnessed an increase in the P&L retained earnings reserve, indicating a retained profit after any dividends. That is quite a credible performance. Sadly Exprodat has filed minimal accounting details for most years between 2002 and 2014, so the company’s exact progress cannot really be determined. But full accounts were provided in 2012, which showed revenue of £3,670k and an operating profit of £458k, and 2013, which showed revenue of £4,257k and an operating profit of £230k. Full accounts were also provided in 2003, 2004 and 2005, which showed revenue of around £640k and operating profit averaging £26k for those three years. * Companies House has also revealed GTC non-exec chairman Stuart Paton has become a director of Exprodat. I thought this appointment was unusual because: i) the chief exec, rather than the chairman, became a director of GTC’s previous acquisition, and; ii) a non-exec becoming a director of a subsidiary would suggest he is more of an executive. I note that GTC’s last four RNS announcements have carried statements from the non-exec chairman rather than the chief executive, who is set to step down from his executive role at the end of July. There is still no word on who will become the new chief exec, and it seems as if the chairman may continue to become more involved in operations from here. I now wonder if Dr Paton will become an interim chief exec. There could be much worse candidates. * The Exprodat deal involves GTC paying cash of £508k, £250k of which has been paid already and the balance is due in January 2017. So there was cash available for the deal, but GTC could be coming close to a net-cash neutral position if the ERCL earn-out has to be paid in full. For what it is worth, I doubt GTC will pay the ERCL earn-out in full (due to the group’s subsequent performance) and I am pleased there is no earn-out with this Exprodat deal. GTC’s 2016 annual report ought to confirm any revisions made to the ERCL earn-out. With GTC’s market cap at £9.4m at 25p a share, not paying a £980k-plus ERCL earn-out would be significant to my valuation sums. It seems this deal will diversify GTC’s services to the oil sector, as well as diversify its services to outside the oil sector. As such, GTC’s dependence on its proprietary geodata libraries will diminish, which may help in the shorter-term, but long term — assuming an oil-sector recovery — may not make the group’s margins and cash flow as attractive as they once were. The deal also makes GTC’s progress even more complicated to evaluate. Probably the best highlights of the deal are: i) Exprodat’s staff earn very attractive revenues per head, and; ii) the record of the business is long and profitable. I am still unsure about GTC’s valuation and am happy to await further results. I would also like to see the appointment of the new chief exec sooner rather than later.